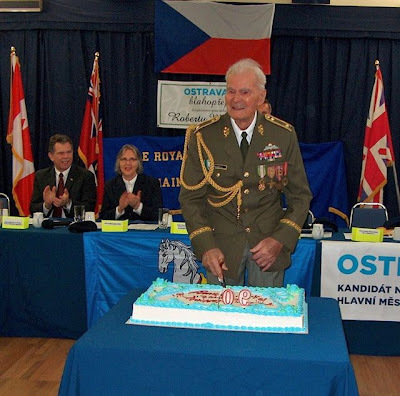 Robert Matula was promoted to brigadier-general in the army of the Czech Republic on the occasion of his 90th birthday. Photograph by Gordon Hughes. Robert Matula's hearing is fading, as is his eyesight. He walks with a stoop, needs kidney dialysis three times a week. He endures the tribulations of living to a grand age with good humour, a friend says. His condition has not yet forced him from his home at Chemainus, the seaside community where he is well known at the local branch of the Royal Canadian Legion. His name, little known elsewhere on Vancouver Island, is also spoken with reverence in a corner of the Czech Republic. The Czechs remember Mr. Matula as the saviour of Ostrava. In 1944, he parachuted into his occupied homeland, embarking on a campaign of sabotage with partisans. Armed only with a submachine gun and his own ferocious will, he delayed a German column advancing on the industrial city. Mr. Matula arrived in Canada more than a half-century ago, finding work as a labourer with Canadian Pacific before working his way up to performing maintenance on diesel engines. He moved to Vancouver Island in retirement. A man with sharp features, including dark-set eyes and a nose as pointed as an eagle's beak, it is not hard to imagine Mr. Matula as a commando. His memory remains sharp, though these days his story is more often told by others. He has lived in obscurity for most of his time in Chemainus. In recent years, his homeland has made a special effort to recognize a brave warrior. Mr. Matula was born to a wounded veteran of the Great War, a conscript in the army of Austria-Hungary. The boy arrived little more than a year after Czechoslovakia's own creation from the ashes of the Hapsburg Empire. A teenaged miner when Germany occupied the Sudetenland region, he crossed the Polish frontier to join patriotic elements of the armed forces in exile. The Poles had the Czechs join the French Foreign Legion. After the German invasion of Poland, and the subsequent declaration of war by France and Britain, he joined a Czech infantry brigade in southern France. Briefly taken prisoner by the Germans, he and his unit escaped to join the French army in retreat. He fled by sea to Britain, where he was recruited by British intelligence and trained in explosives, parachuting, and burgling techniques. Issued fake papers as a lumber clerk and butcher, he had dental work done in the Czech style by an expat dentist and wore civilian clothes made by a Czech tailor before parachuting with five others into the Moravian mountains on Sept. 13, 1944. The drop was a fiasco, as they missed their landing area. One man was killed and the radio operator captured. The survivors regrouped and eventually made contact with local partisans, as well as with Allied forces in London and in the approaching Soviet Red Army. The mission, code-named Wolfram, harassed the Germans in a deadly campaign of sabotage. In the final days of the war, Mr. Matula's brave attack on a German column caused temporary confusion in enemy ranks, allowing a Czech tank brigade fighting with the Soviets to capture Ostrava in what is remembered as the bloodiest battle on Czech soil. At first seen as liberators, the Soviet forces came to be seen as occupiers. Mr. Matula fled his homeland a second time, crossing the mountain border on foot into Bavaria, part of the British zone of occupied Germany. He and his British wife immigrated to Canada a decade later. A forgotten warrior has been recognized by the Czechs as survivors of the war dwindle in number. The deputy mayor of Ostrava presented him a medal on the occasion of the 60th anniversary of the liberation of Czechoslovakia. On his 89th birthday, he was presented a Czech Gold Cross. Last month, on the day before his 90th birthday, Mr. Matula was presented with a crisp new uniform befitting his promotion to brigadier-general. A ceremony held at the Chemainus Seniors Centre was attended by Czech officials from Ostrava and Washington. Sometimes, a hero's reward comes late in life. The surrealist comedy troupe Firesign Theatre appeared in a live performance on Whidbey Island in Washington earlier this month. The quartet of unapologetic Marxist-Lennonists (they once subtitled an album All Hail Marx and Lennon , with the jacket decorated with portraits of Groucho and John) won a devoted following in the 1970s with such albums as Don't Crush that Dwarf, Hand Me the Pliers , and I Think We're All Bozos on this Bus . One of the troupe has a surprising connection to B.C. Phil Proctor's daughter, Kristin, an actor, is married to Premier Gordon Campbell's son, Geoff. The Proctor and Campbell merger has produced a grandson for two doting grandfathers. Perhaps the connection is not so unlikely if one takes into account the Social Credit roots of some Liberals.